BERLIN -- Volkswagen AG's two-year effort to merge with Porsche SE is on the brink of being scrapped as legal problems and taxes confound ambitions to unite Ferdinand Porsche's legacy. The supervisory board of Europe's largest carmaker will consider alternatives to the 2009 merger agreement at a meeting on Nov. 18, the final scheduled gathering this year, two people with direct knowledge of the situation said. To avoid further delays in cooperation, VW may drop a merger and instead buy Porsche's carmaking business, the people said, speaking on condition of anonymity because the deliberations are private. "The future structure of VW-Porsche has been hanging over their heads for some time," said Juergen Pieper, an analyst at Bankhaus Metzler in Frankfurt. "It's in VW's best interest to achieve clarity on how to proceed." 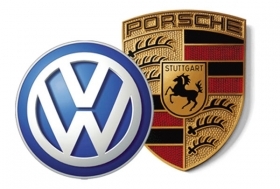 Porsche SE holds 51 percent of VW common stock, and VW, in turn, owns 49.9 percent of Porsche's automaking business. VW CEO Martin Winterkorn is seeking to integrate the lucrative Porsche car business into VW to bolster his goal of surpassing General Motors Co. and Toyota Motor Corp. as the world's largest auto company. The sports car maker reported operating profit equivalent to 19 percent of sales in the first three quarters of 2011, more than double VW's 7.7 percent margin. Sales of Porsche cars rose 28.2 percent in year-on-year figures to 100,391 units in the first ten months. The company aims to double annual sales to 200,000 by 2018. Volkswagen expects a combination with Porsche to further boost profitability, with savings of 700 million euros ($950 million) projected from completely integrating the luxury carmaker with VW's portfolio of brands that include Audi, Lamborghini and Bugatti. The two companies have been working on a full-blown merger since 2009, when Porsche failed in its attempt to take over VW. That goal was scrapped in September as lawsuits in the U.S. and an investigation by German prosecutors made a valuation impossible. Short sellers of VW stock have sued Porsche in the U.S., claiming the carmaker secretly piled up VW shares and later caused the investors to lose more than $1 billion. The main alternative to the original merger agreement is for VW to exercise options to acquire the remaining 50.1 percent stake in Porsche's automaking business for 3.9 billion euros, leaving Porsche SE as a holding company for its majority stake of VW's common stock. Five out of 10 analysts surveyed by Bloomberg see this as VW's likeliest move. "A straightforward purchase of Porsche's operations would seem the smoothest path for VW" and a "great bargain," said Frank Schwope, an analyst with NordLB in Hanover, Germany. Volkswagen's preferred stock has advanced 86 percent over the past two years, while Porsche shares have fallen 4.8 percent. The drawback is that the options can't be exercised until Nov. 15, 2012, and would then trigger a tax bill estimated by VW at about 1 billion euros, overwhelming the potential savings. The taxes would shrink to zero by the second half of 2014, according to VW. Analysts surveyed by Bloomberg project VW to exercise the options in 2013 to avoid the worst of the tax bill. Marco Dalan, a VW spokesman, declined to comment. Aside from financial considerations, personal ambitions play a role in the timing of a deal. Ferdinand Piech, 74, VW's chairman and a member of the family the controls Porsche, crossed his cousin, Wolfgang Porsche, to help block the takeover in 2009. He has been a strong backer of the combination of the two companies, which both trace their origins to his grandfather Ferdinand Porsche, who founded the sports carmaker and developed the VW Beetle under a contract with the Nazis. Piech has the support of a majority of VW's board for a third five-year term as chairman as the company seeks to avert a leadership gap with no clear succession plan in place, two people familiar with the situation said Oct. 26. "It's obvious that the desire is great not to wait too long" to complete the combination, Hans Dieter Poetsch, the CFO of VW and Porsche, said on Sept. 12 at the Frankfurt auto show. Other scenarios include a delayed merger or simply maintaining the current structure. "It is possible the announcement could be no merger," said Michael Tyndall, an analyst at Barclays Capital in London. In that case, VW and Porsche could extend the merger framework plans until the legal risks clear up, he said. Claimants in Germany are seeking 1.1 billion euros in damages. Prosecutors in Stuttgart are also investigating suspicions that Porsche didn't adequately inform the market about its intentions to take control of VW. Porsche would bear the legal risk on its own if the automaking business is sold and a merger postponed. Porsche and VW agreed to combine in 2009 after Porsche racked up more than 10 billion euros of debt in an unsuccessful attempt to gain control of VW, which makes more vehicles in a week than the luxury carmaker does in a year. "We're looking at a disorderly process toward bringing about the integrated carmaker," said Marc-Rene Tonn, an analyst at M.M. Warburg in Hamburg. "There's not the slightest bit of doubt on behalf of VW and Porsche that they will and should combine. But more than two years after making that pledge, they still haven't achieved their goal."